2015 Vauxhall Astra 1.4i 150 Turbo review | What Car? If you were asked to think of a mid-sized family hatchback, chances are it would be one of three cars: a Ford Focus, Volkswagen Golf, or Vauxhall Astra. You’d be right to as well; these three are captains of the sales charts in this segment. That means a new model from any one of this trio is big news, so the fact that there’s a new Vauxhall Astra makes for a powerful headline. It really is all new, too. The body is smaller, lighter, and more streamlined to aid performance and efficiency, but they’ve upped the cabin space as well. There are also new engines, which include this 1.4-litre turbocharged petrol. It comes in two power outputs – 123bhp, or the 148bhp that we’re testing here. In this iteration it’s more powerful than any of the previous Astra’s petrol engines, but offers better economy and emissions. That said, it’s still some way off the ultra-efficient Golf 1.4 150 TSI. The Astra's on-board tech has taken a leap forward, with the availability of new features such as LED headlights, Forward Collision Alert with autonomous braking, and massaging seats. The vastly improved infotainment system includes onboard 4G-connectivity, WiFi hotspot, access to Apps and the ability to use your smartphone via the touchscreen. If you’re thinking that with all these improvements Vauxhall’s bound to have bumped the price up, you’d be wrong. In fact, the general rule is that it’s cheaper than the old car, by up to £2200. What’s the 2015 Vauxhall Astra 1.4i 150 Turbo like inside? The fussy, button-laden dash of the old car has been replaced with a swooping, elegant and much cleaner design. Clear instruments and sound ergonomics work hand-in-hand with pleasing materials that include lashings of gloss-black and chromed surfaces on the higher trims. Compared to a Focus’s cheaper-feeling cabin, the Astra is now streaks ahead, although it misses out on the rock-like feel of a VW Golf. Centre stage of the fascia is the new 7.0in touchscreen, which again, is a vast improvement in looks and usability. The menus are easily understandable and slick, while the screen is crystal clear. 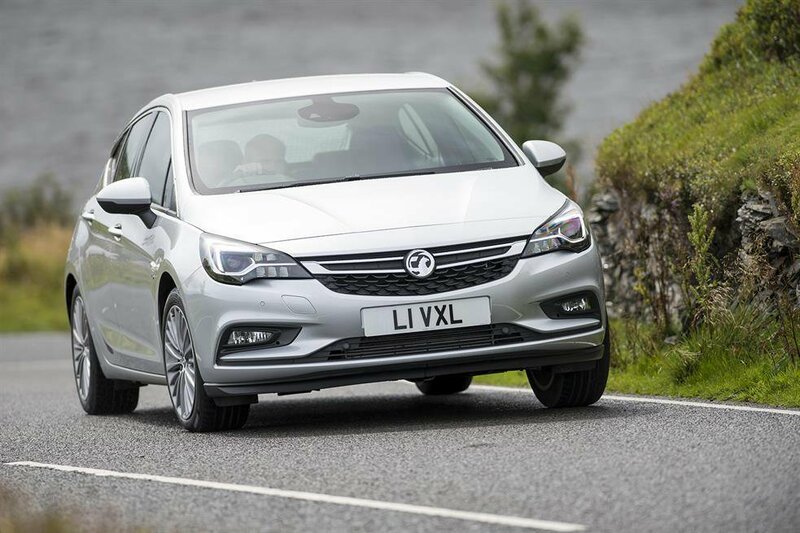 All these cars offer decent driving positions, and the Astra’s is no exception. The seat and steering wheel can be tuned to fit most sizes, but we’d suggest you go for the Ergonomic driver’s seat (£250); it’s optional on all but Elite trim and includes lumbar adjustment, which alleviates the deficiency of lower-back support inherent in the standard seats. Move to the back seats and you’ll be in for a pleasant surprise: there’s loads of space on offer. In fact, forget the aforementioned rivals, the space back here isn’t far off the voluminous Skoda Octavia, with room to seat two tall adults in comfort. A third person will also fit, but then things get a bit more friendly. The boot’s a good size and shape, although not outstandingly versatile. You have to heave heavy items over a high loading lip, and there’s no twin-height floor or under-floor storage. Also, if you fold the rear seats down, you’re left with a sizable step in the extended load area. What’s the 2015 Vauxhall Astra 1.4i 150 Turbo like to drive? The weight saving we talked about earlier has paid dividends in how nimble the new Astra feels to drive. It’s also helped by the suspension, which keeps the Vauxhall feeling well-planted, with little body roll. It’s not perfect though: the steering, while very accurate, hasn’t much feel or weight away from the straight-ahead; and although the brakes stop you really well, the pedal action feels a bit mushy. All that excellent body control does come at the expense of the ride quality. The Astra feels firm at times, especially around town, although not unduly uncomfortable; you just find yourself being jostled around as the body earnestly tracks the topography of the road. On balance, a Ford Focus still offers a better blend of ride and handling. This 1.4-litre engine has plenty of poke, and starts pulling from as low down as 1250rpm. It’s relatively smooth all the way up to 5000rpm, after which it starts to sound boomy. However, as so much of its performance comes from farther down the rev-range, there’s rarely a need to extend it to this point. The default gearbox is a six-speed manual. It’s light and precise, although doesn’t have quite the pleasing precision of a Focus’s gear change. If you’d rather have the gears shifted for you, a six-speed auto is an option. Take the Astra up to motorway speeds and it feels completely at ease. There is a bit of wind noise from around the door mirrors and some background road roar, but nevertheless, this is still a car that’ll keep you relaxed on a long journey. This new Astra hasn’t broken new ground. In fact, ultimately, it doesn’t feel class leading in any area. Importantly, though, it hasn’t got any major weakness, either. That means that as an overall package, it’s still right up there with the class best. All the important boxes have been ticked: it's good to drive and spacious, plus in our recommended SRi Nav trim, it's excellent value and very well equipped. The 148bhp 1.4-litre petrol is relatively smooth and quick, but if you’re a high-mileage company car user, we suspect the cleaner, more flexible 1.6-litre diesel will make more financial sense. As will the cheaper but equally well equipped TechLine trim (not available with this manual 1.4). Either way, it would be wise to make sure you stick the Astra on your shopping list.